Ok, first off, this isn’t a shifter story. I know right? 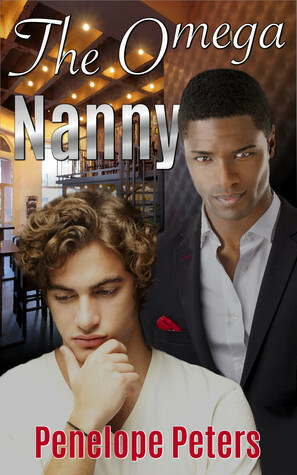 With a title like “The Omega Nanny” you’d assume that it’s some kind of werewolf book. Nope. The world set up is strange, one I haven’t read before, and though it was confusing, I liked it. In this world, there are people who are born as Alphas, Betas and Omegas. Apparently Betas didn’t have much rights and weren’t treated like Alpha’s and Omegas. In the story, Thomas is an Alpha who’s wife had died, leaving him to raise their baby girl with the help of his sister. Then his sister finally finds a mate and wants to leave so Thomas needs a dependable nanny for his kid. Kieran is an Omega and is working hard to save up money to pay his parents back for a broken engagement. That little plot didn’t make much sense to me, but hey, I went with it. Kieran ends up being Thomas’ nanny and they start falling for each other. I liked these two, but I was frustrated at the same time. I didn’t get enough Kieran and Thomas alone time. Plus I felt like it was missing some info in places. And what was up with Thomas’ dead wife? lol Was she a ghost? Ah well. It was an interesting take on the Alpha/Omega attraction without shifters involved. What a great book. I have really taking a liking to paranormal books. And this one is no exception. I really enjoyed this read. I really enjoyed watching the attraction between Kieran and Thomas. Their was so much push and pull between them. It was like they would take one step towards each other only to take ten steps away from one another. Kieran in my opinion was so scared that the attraction between the two of them was not real and that it was only because of being an omega and the pheromones that he put off that he did not trust himself to make the right decision. Thomas in my opinion knew he was falling for Kieran but he was scared to admit his feelings for him especially after losing his last mate. But his attraction is so strong towards Kieran that no matter how many times Kieran pulls away, Thomas takes a step forward. It is that fear that both men have that almost costs them each other. The question is will the fear of admitting he is in love with Kieran be to much to admit his feelings for him. And is the fear that Kieran has about it not being real enough for him to walk away. It was really such a great story line and I am glad I read this book. I think many more will enjoy it also. Hmmm… where to start with this story… I think the main redeeming factor for me was the child. Jessie was adorable and what held this story together for me. She helped to create an atmosphere that was more conducive to the story. I had a major issue with Thomas. He was cowardly, stubborn, mean and not at all what I would picture an Alpha to be like. Not only was he stubborn about his own desires, but he used his coworker Nora in a way that was icky and mean. I know she knew what was happening, but it doesn’t really make it better. Kieran is adorable, but he’s adorable in that too innocent way. He was tired of the previous Alpha not really wanting him – he wanted the fairy tale romance, which is sweet and not super realistic. I did like that his family, despite him slightly rejecting them, kept coming around to show him what that he was still loved. I really liked that his dad never gave up. I do with that we knew more about Cameron and Desmond’s relationship – that felt unfinished and strange – it was really just left hanging out there. Overall, while I liked the ending of this story – to get there, there really was no challenge – Thomas just needed to get over himself. I wrote my first story when I was nine years old. I don’t remember much of it – and I suspect the original manuscript is somewhere in my parents’ house – but I remember waking up from this super crazy dream about a princess and an underground cave, and I couldn’t shake it. Until I wrote it down, anyway. I kept writing after that – I was always writing something, turning every school assignment that I could into a story, which probably annoyed my teachers to no end. I even wrote fanfiction, long before I knew to call it “fanfiction”. But back in the days when computer monitors showed four colors only, I didn’t have a way to share it. Which, considering how terrible it was (and trust me, I’ve read it since, it really was terrible), is probably just as well. I dreamed of writing my own books. Okay, maybe I figured they’d be sitting on a physical shelf in a physical bookstore somewhere, but… as a series of data on someone’s e-reader is just as good! I’m currently at work on the next novel in the Downing Cycle. When I’m not writing, I’m either cross-stitching, playing with my two sons, cooking for my family and friends, or paying due deference to the cat.